Folkscene’s Howard Larman introduces Peter Case on a live radio program to open On the Way Downtown, the latest release from the singer/songwriter. 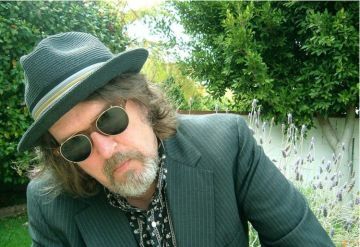 The album takes two live performances from Peter Case in 1998 and 2000, live versions for his recordings, Full Service, No Waiting featured on the 1998 segment and Flying Saucer Blues with the 2000 appearance. The title track for On the Way Downtown is diary pages from a youth as it gets bitten by a musical bug. Personal tales mingle with the stories of Peter Case as he hopes for good results in “Until the Next Time”, walks outside to view his street-dwelling neighbors on “Green Blanket (Part 1)”, and stages vignette characters heading into a snowy night with “Spell of Wheels”. The Folkscene radio show ran for nearly forty years, hosted by Howard Larman for thirty-seven years until his death in 2007, along with his wife Roz, who passed away in October of 2016. Peter Case backed his in-studio show with a full band in 1998, paring the songs to an acoustic backing in 2000. Guitar strums are rushed to a quicker pace chased by the David Perales’ fiddle riffs on “Coulda Shoulda Woulda”, the pair opening the acoustic portion of On the Way Downtown with a Memphis trip told with “Walking Home Late” as they follow the promise of something out into “Beyond the Blues”, and hit the road in “Paradise, Etc.”. 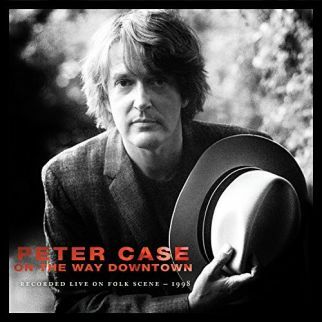 Peter Case plays a Mississippi John Hurt song with “Pay Day”, trails a runaway into NYC on “Crooked Mile”, and captures a moment in time with “Something Happens” while On the Way Downtown nails history to its track listing with “Still Playin’”.